Each summer, I head out on a backpacking adventure with a buddy, usually to a US national park. One of my favorite trips was along Mt. Rainier National Park’s Wonderland Trail in Washington. While some hikers opt to complete the 93-mile loop trail in one shot (in as few as five or as many as 15 days), we chose to explore a 30-mile stretch of the trail in the park’s northwest corner over four days. 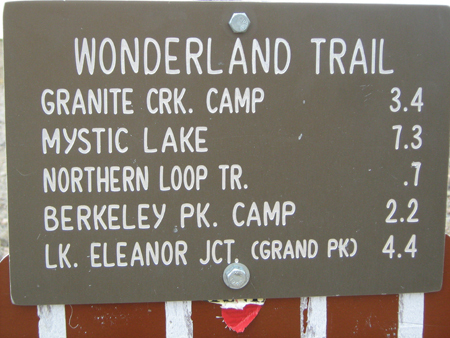 Since the Wonderland Trail makes so many “best backpacking trail” lists, it can be difficult to secure a backcountry permit. We planned our trip well in advance and reserved our permits months before we hit the trail. The park begins accepting reservation requests on March 15th, and receives around 1,400 requests before they start processing them on April 1. Don’t panic if you didn’t plan ahead — Mt. Rainier sets aside about 30% of the permits for distribution on a first-come, first-served basis on the day of (or the day before) your hike. We set out from the Sunrise Visitor Center, where our wives parked the car and hiked in a ways with us before they looped back to Sunrise. Unfortunately, our first day was overcast with a light, misty rain. The views of the mountain from this area are probably spectacular, but our views were limited to the scree slopes and hillsides around us. Still, we had some dramatic views, especially back to the east. We also saw quite a few marmots playing amongst the rocks! About 5.2 miles from the trailhead, we made our first campsite at Granite Creek. Sites here are fairly isolated from each other, tucked into a dense forest along a creek. The sites included posts for hanging our backpacks on, keeping them off of the ground (and, in turn, keeping critters out from them!). The sound of rushing water made up for the lack of a view from camp, and the blue sky the next morning made us eager to hit the trail! Day two took us from Granite Creek to Mystic Lake. The 5.5-mile trail meandered through dense forest, but through the trees, it offered great views of Mt. Rainier to the south. A highlight of this stretch of the Wonderland Trail is the massive Winthrop Glacier. The trail skirts the terminus of the glacier and offers great, up-closer views of this canyon-carving wonder. From the glacier, the trail follows the West Fork of the White River to Mystic Camp, about 0.2 miles from picturesque Mystic Lake. Too shallow for a swim, the lake offered a great spot to soak our tired feet. While we really enjoyed our first two days on the trail, the third day was spectacular — one of my favorite days of hiking, ever. The trail left Mystic Camp and wandered past meadow-lined lakes, through forests, and past an active ranger cabin with an amazing view of the mountain (where we stopped to watch rockslides high atop the mountain with the rangers and some fellow hikers). Sunbathing marmots greeted us in wildflower-filled meadows, the impressive Carbon Glacier sent a torrent of water down the mountain, a suspension bridge crossed the Carbon River, fantastic views of the mountain abounded, and several rushing waterfalls capped off an amazing day of hiking. And did I mention the wild mountain blueberries? Yum! Nothing like playing in the snow in summer! Delicious blueberries growing wild along the trail. At Carbon River, the Spray Park Trail forks from the Wonderland. Rather than follow the river valleys to the north, we decided to head south and camp at Cataract Valley, about 6.5 miles from Mystic Camp. This campground was tucked into the forest, and offered not only a small creek for drinking water, but a “real” toilet (well, as real as they get in the backcountry … of the composting variety). We left Cataract Valley camp the morning of our 6.5-mile day four and headed south-southwest into Spray Park. The Spray Park Trail eventually climbs above the timberline, but not before meandering through beautiful wildflower- and waterfall-filled meadows. Eventually, the trail leaves the trees and meadows and traverses the scree slopes on its way to year-round snowfields! After descending from the snowfields, a short 0.1-mile spur trail heads over to aptly-named Spray Falls, where we met our lovely (and noticeably more hygenic) wives, who’d hiked the two miles in from the Mowich Lake parking lot, where we all had lunch before heading out. The Wonderland Trail is famous for its up-and-down terrain, ever-changing views of Mt. 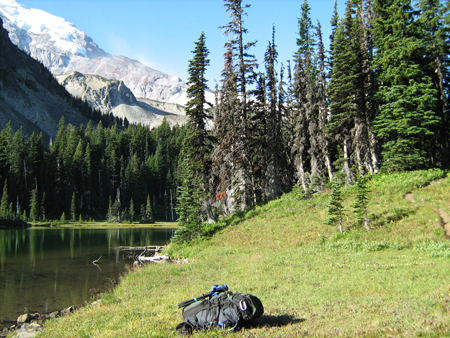 Rainier, and wide variety of landscapes. This 30-mile stretch of the trail gave us tastes of each, and left us looking forward to a return trip to the park to explore another chunk of the trail! What’s your favorite backpacking trail? Leave us a note in the comments below. Enjoy your next backpacking adventure, whether it’s for a week or a weekend!